" When deciding on a service provider to organise this important event, we needed a partner we could rely on. Kenes was our management company of choice, responsible for every aspect of the conference.	" Geneva, Switzerland, May 12, 2015 – Kenes Group, a leading Professional Conference Organiser (PCO) and Association Management Company (AMC), today announced its recent partnership with the Government of Bangladesh and Partners in Population and Development (PPD), an inter-governmental organisation of 26 developing countries, to organise the 12th International Congress on AIDS in Asia Pacific (ICAAP12). The conference will be held in Dhaka, Bangladesh at the Bangabondhu International Conference Centre, November 20-23, 2015. For over two decades, the International Congress on AIDS in Asia Pacific (ICAAP) has become a leading venue for AIDS activists, people living with HIV/AIDS, policy makers, government ministries, academics, clinicians, researchers, pharmaceutical companies, and international agencies from Asia Pacific to gather together. ICAAP12, the largest AIDS conference in the region, looks forward to welcoming more than 3,500 delegates to this important four-day event. The conference theme and the ultimate objective of this event is to “Be the change towards an AIDS-free generation; our right to health.” The ICAAP12 conference will highlight Bangladesh’s and the region’s aim to achieve an AIDS-free generation through science, innovation, and community involvement with government leadership. ICAAP12 is the first global meeting to be held immediately following the 2015 deadline to address the United Nations’ Millennium Development Goals. ICAAP12 is supported by the Government of Bangladesh, Partners in Population and Development (PPD), an Inter-Governmental organization of 26 developing countries, and other local organisations. 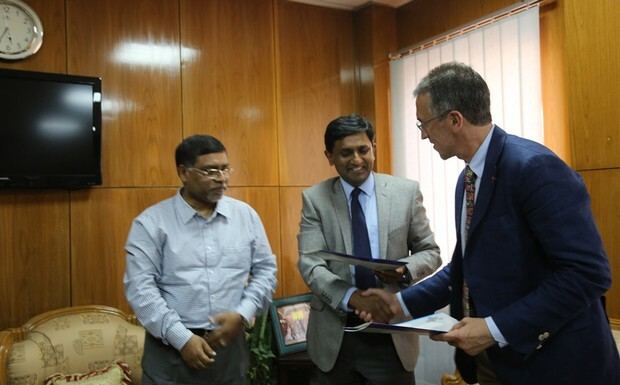 Community groups will be able to participate in ICAAP12 through scholarships and support provided by government and donor agencies, and doctors, researchers, academia and some of the region’s leading decision-makers will be represented in Dhaka in November. Partners in Population and Development (PPD) is an intergovernmental initiative created specifically for the purpose of expanding and improving South-to-South collaboration in the fields of reproductive health, population and development. PPD was launched at the 1994 International Conference on Population and Development (ICPD), when ten developing countries from Asia, Africa and Latin America formed an inter-governmental alliance to help implement the Cairo Program of Action (POA). This POA, endorsed by 179 nations, stresses the need to establish mechanisms to promote development through the sharing of experiences in reproductive health (RH) and family planning (FP) within and among countries and to promote effective partnerships among the governments, Non-Governmental Organizations (NGOs), research institutions and the private sector. Visit the website at: www.partners-popdev.org. For over the 20 years, the International Congress on AIDS in Asia Pacific (ICAAP) has emerged as an effective venue for AIDS activists, people living with HIV/AIDS, policy makers, government functionaries, academics, clinicians, researchers, and pharmaceutical companies, international agencies to gather and take stock of their activities. International AIDS Congresses have evolved from being largely academic and biomedical in orientation to major gatherings of all those involved in HIV/AIDS work and central focus points for discussion around development in the epidemic. There is a growing demand for using the congress to build political alliances and commitment by governments and the business community to the epidemic.